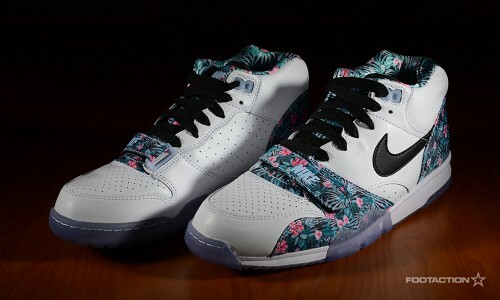 Just in time for the 2014 NFL Pro Bowl, the Nike Air Trainer 1 Mid is a superb celebration sneaker as its adorned with an island-inspired floral print across the inner lining, heel, tongue and forefoot. The Swoosh and laces come in a smooth jet black paired with a translucent icy outsole. With the game and festivities taking place in Hawai’i every year, the look of the shoe matches the scenery perfectly. However, further than just looks, the Air Trainer features a hybrid mid-top design with a premium leather upper for multi-sport use and supportive fit. Available at our 34th Street store in New York City and Garden State Plaza in New Jersey only tomorrow. Print article This entry was posted by hhcblog on January 24, 2014 at 11:27 pm, and is filed under Footwear. Follow any responses to this post through RSS 2.0. You can leave a response or trackback from your own site.